At UNITED HOUSE Publishing we offer 3 different plans for writers at various stages. 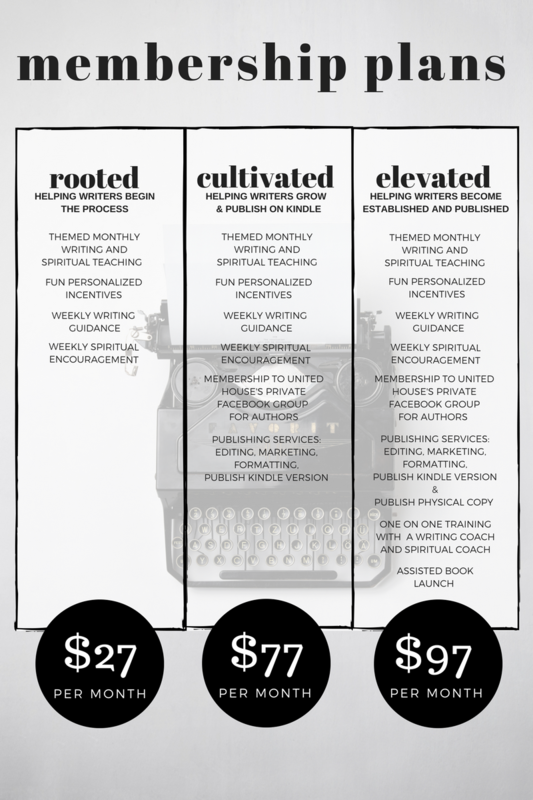 The rooted plan is for those who want to begin their writing journey, get helpful tips, and spiritual encouragement on a weekly basis as they pursue the gift that God has given them. This path would even be great for bloggers or for those who want to self-publish. You can sign up for our rooted membership HERE. The cultivated plan is for writers who are looking to join a community exclusively for authors, are ready to start or are currently working on a book, and want to publish it on the Kindle format. For this plan, we do have a brief interview process and application to fill out. Our membership is currently closed. Please sign up for our newsletter below to be notified of next open application period. The elevated plan is for authors who want one on one coaching and guidance, want to be a part of an author community, looking to release a physical copy and Kindle version of their book, and want assistance with launching their book. We take the author from concept all the way through completion. For this plan, we do have a brief interview process and application to fill out. Our membership is currently closed. Please sign up for our newsletter below to be notified of our next open application period. The elevated plan also has a track specifically designed for authors who have a completed book and are ready to submit a manuscript. Because of this, writers have the unique option to start on the rooted plan anytime, grow as a writer, edit a current work, and make adjustments to a manuscript in order to get it ready to submit to UNITED HOUSE. At the next open enrollment the author has the potential to upgrade to our elevated plan, if accepted, with a complete manuscript ready to go, therefore speeding up the publishing process. To ensure a quality experience for all of our writers, UNITED HOUSE Publishing has open enrollment for our Membership Plans every 4 months. Membership for our Cultivated and Elevated plans is currently closed. To hear the latest announcements and be notified of our next open enrollment, be sure to sign up for our NEWSLETTER, by entering your email address below.